Thank you for signing up for the Heid Music and Alfred Music Publishing mailing lists. 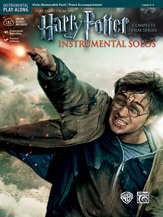 Below, please find your free sample from Harry Potter Instrumental Solos: Selections from the Complete Film Series. Find the instrument that you play to download your sheet music, demo track, and play-along track. You can right click on the corresponding link to download each file. View all of Alfred's Play-Along titles here.